The Paulick Report is once again pleased to offer its special print publication available online and on the grounds of the Keeneland Association in Lexington, Ky., during the annual September Yearling Sale, which runs through Sept. 23. 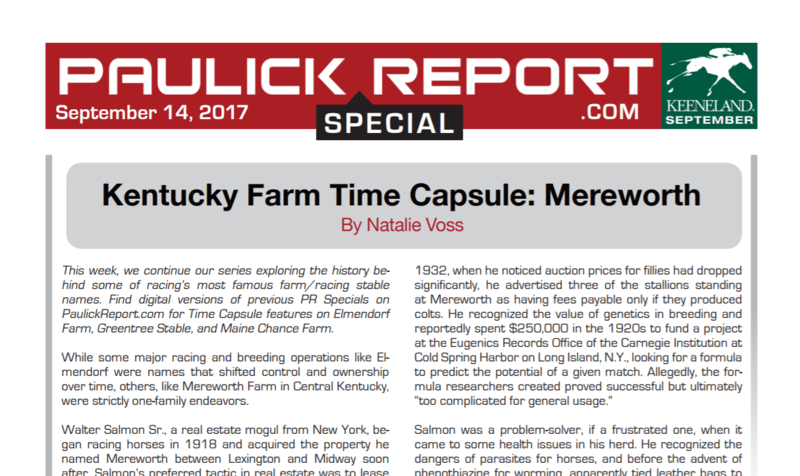 In this edition of the PR Special, Eclipse Award-winning writer Natalie Voss continues her “Kentucky Farm Time Capsule” series with a look at Mereworth Farm, established by New York real estate mogul Walter Salmon Sr., who became a pioneer in breeding for the commercial yearling market. Salmon also helped create the Breeders' Sales Company, which eventually became part of the Keeneland Association. Dr. Kathleen Paasch, DVM, of Rood and Riddle Equine Hospital, answers your questions in “Ask Your Veterinarian.” In this installment, she explains how problem joints are not created equally and stresses how important it is for buyers to find a veterinarian they are comfortable with to examine repository radiographs. Sporting Chance, winner of the Grade 1 Hopeful Stakes, is the subject of Chelsea Hackbarth's “Honor Roll,” having been picked out of Peter O'Callaghan's Woods Edge Farm consignment at the 2016 Keeneland September Yearling Sale by Hall of Fame trainer D. Wayne Lukas. This entry was posted in PR Special, Ray's Paddock and tagged Ask Your Veterinarian, Keeneland September, Kentucky Farm Time Capsule, Mereworth Farm, Pioneerof The Nile, PR special, sporting chance by Paulick Report Staff. Bookmark the permalink.